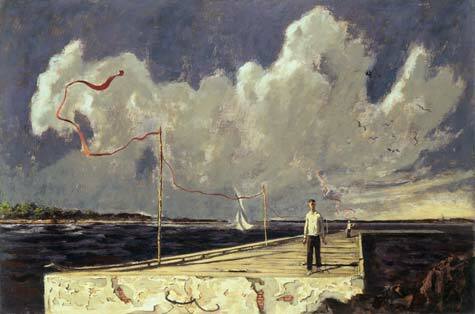 Born in Eustis, Florida, Hughie Lee-Smith spent most of his childhood in Georgia under the care of his very strict grandmother. He often described his early life as isolated, as his grandmother limited his friendships and activities. This sense of alienation continued throughout his life, and mirrored the discrimination he felt as an African-American in mainstream white society. Although a sense of melancholy invades this painting, the sunlight reflecting on the red streamers and white clouds suggests not only the end of the festival, but the beginning of a new chapter.